For years, Seattleites in the know have traveled across Lake Washington to Bellevue for its better Chinese food. That is changing, partly because many successful Eastside restaurants are opening Seattle-side. But Bellevue is still the destination for unique offerings from Chinese breakfast to dessert, ranging from the innocuous to the adventurous. 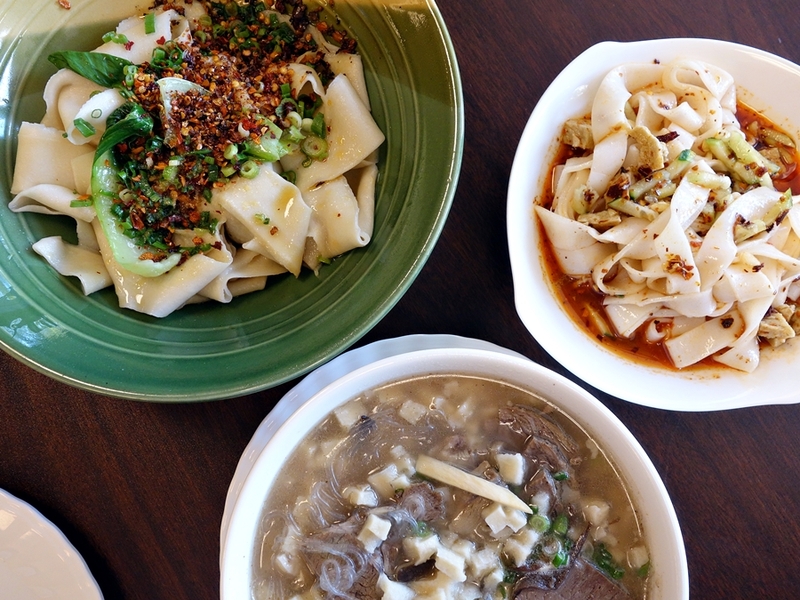 From biang-biang noodles to pungent hot pots, here’s a guide to some of the best dishes to enjoy in Bellevue just in time for your celebration of Chinese New Year. Boiling Point: Choose from ten individualized hot pots that have a variety of broths and ingredients. Try the House Special Hot Soup, which features stinky tofu. Get past the pungent smell of the fermented tofu, and there’s a lot to enjoy. Like the best of stinky cheeses, stinky tofu’s flavor is complex (slightly sour and nutty) and can be an acquired taste. If still not convinced, then get the Taiwanese Spicy Hot Soup. It’s super-spicy. Cafe Ori: This Hong Kong-style Cantonese restaurant has a bit of a homey feeling. Enter and you feel like you’re in someone’s large living room, with an unused fireplace and a bookcase containing an old Hi-Fi system, a sign of better times in the past. The same can be said for the food, though the Pan-Fried Squid with Salt & Pepper still has its shining moments, even if just for nostalgic reasons. Din Tai Fung: This international import is most famous for its XiaoLongBao (or Juicy Pork Dumplings). And, yes, these soup dumplings are delicious, even if they’re considerably better in the chain’s hometown of Taipei. The “hidden” gem on the menu: the Shrimp & Pork Shao Mai, juicy and terrific. Note that the long lines subsided after a University Village location opened, and should do so more once downtown Seattle and Southcenter locations open. Dough Zone Dumpling House: This place is so popular that there are two in Bellevue, with a third recently opened in Redmond. The Juicy Pork Buns give Din Tai Fung’s soup dumplings a run for the money—and they’re cheaper. Equally good are a fried “relative” they call Jian Buns, more commonly referred to as sheng jian bao. They’re crispy on one side and yet still juicy on the inside. Facing East: Crowds, particularly crowds of young Chinese people, come to this restaurant serving Taiwanese food that is at once sophisticated and sweet. It’s an ideal place to try Beef Noodle Soup, which many call the country’s national dish and for which there’s an annual festival and competition. Facing East’s version is on the sweet side, but still beefy—and even better with a Taiwanese Pork Burger on the side. 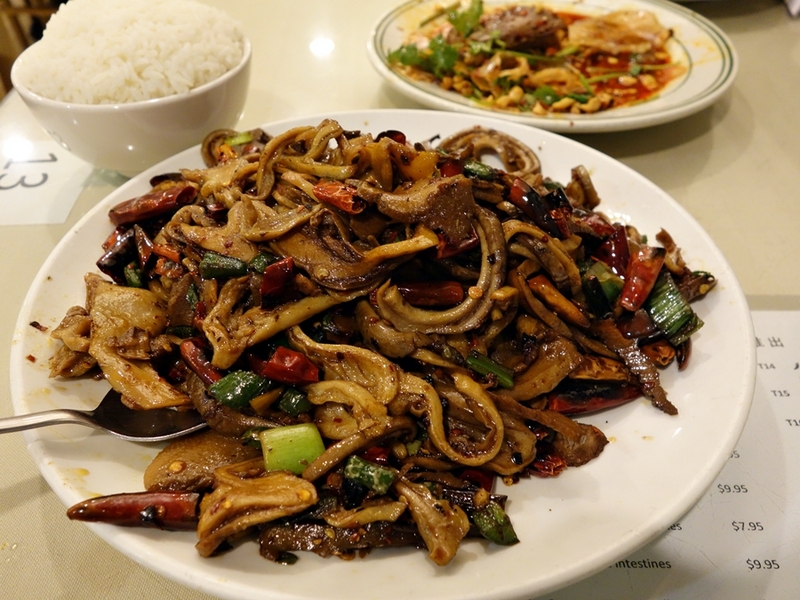 Frying Fish: Sichuan is the Chinese regional cuisine represented best in Seattle, and Bellevue’s Frying Fish is currently the best of the bunch. The place is constantly packed with people eating chili-laden dishes like the chef’s specialty “FeiTang” platters with crab, carp head, frog, and even fish fresh from the onsite tanks. Assorted cold appetizers along with Spicy and Sour Dumplings are a great way to start the meal. Kung-Ho: If offal doesn’t bother you, get the Oyster Noodle Soup. The thin wheat noodles are extremely soft such that you’ll barely chew them. It’s the texture of the soup that’s most interesting, a starchy affair that’s filled with thin bamboo strips, shiitake mushrooms, some oysters, and intestines. With a dash of black vinegar for some acidic kick, it’s a satisfying rendition that’s reminiscent of what you’d find at night markets in Taiwan. Little Garden: The highlights at this little (gardenless) hole-in-the-wall are the Hunan items. If you’re feeling adventurous, get the Stir-Fried Pork Stomach with Dried Bamboo, with smoky notes shining through. Less daring diners can try Pickled Long Beans with Fried Noodles. This restaurant can be especially busy on weekends, even if it doesn’t look it. With only one cook, food comes to just one table at a time; people at other tables will sometimes go out shopping until it’s their turn to eat. Miah’s Kitchen: Technically in Redmond but literally across the street from Bellevue, this is the sister restaurant to Edmonds’ Qin, which introduced the area to Biang-Biang Noodles. Get the “hot oil-seared” version of these, as its simplicity shows off the springiness of the hand-cut wide noodles best. Go with a group, and you can get the same biang-biang noodles layered at the bottom of Chicken on a “BIG” Plate, otherwise known as Dapanji. MonGa Cafe: Like Facing East, this Taiwanese restaurant draws large groups of young Chinese students, but everyone’s invited. Cold dishes like Jalapeños Stuffed with Pork are fun, but save room for Shaved Ice. 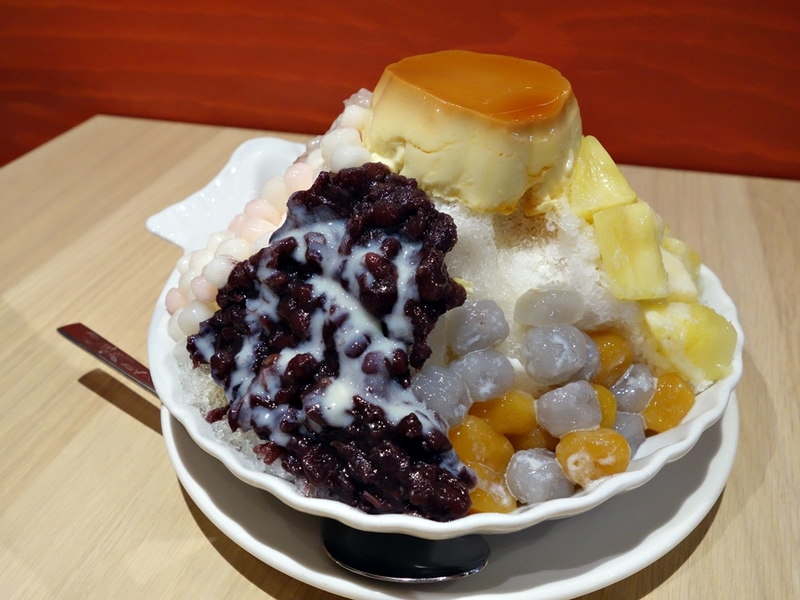 If you get the “large combo,” you can choose five toppings such red bean, taro, and flan—all of which (like most of menu) are actually made in-house. Regent Bakery and Café: As with Miah’s Kitchen, Regent has a Redmond address, but is just across the street from Bellevue. You can stay and eat Hong Kong-style savory dishes here, but it’s the bakery that’s of particular interest. As with many Asian desserts, the cookies, pastries and cakes tend to be less sweet and relatively light. The Green Tea Mousse Cake is colorful and dazzling, and you can make the argument that the matcha makes it healthy to eat. Sichuanese Cuisine: Order the Ants on the Tree. The ants are the bits of ground pork; they cling to the noodles like ants on tree twigs. The noodles are actually bean thread noodles, which are softened and then stir-fried. They absorb a lot of flavor and have a slightly chewy texture. The sauce, of course, is a bit spicy. (You can request a desired spice level.) If you’re still hungry, the Steamed Dumplings are a bargain. 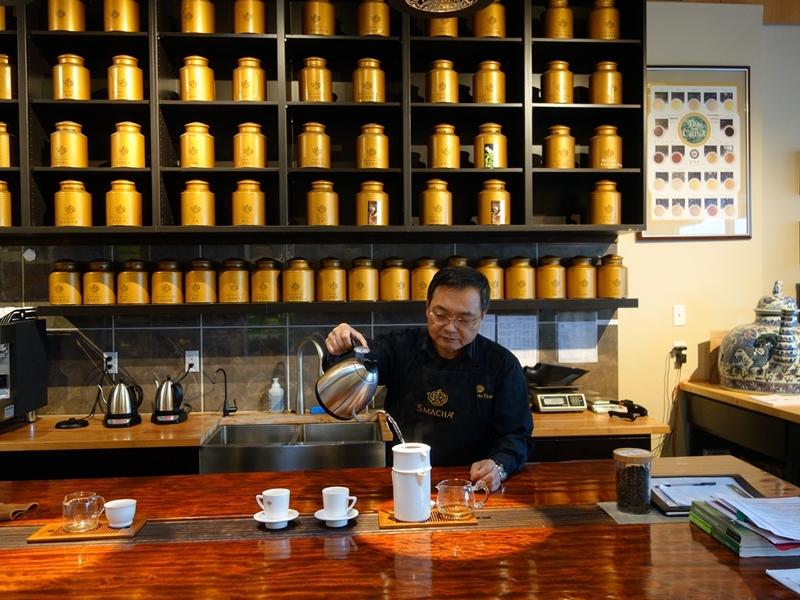 Smacha: The name connotes smartness with tea (cha), and the shop has a wise tea master (with gardens back in China) who’s put together an elegant yet comfortable setting. You can get a wide variety of tea to go (a “cake” block of Pu-Erh is perfect, as it gets better with age), but do yourself a favor and sit at the counter to slowly sip some tea, perhaps with a baked-in-house tea sweet (like a Matcha Mochi Red Bean Cake) to go with it. Spiced: While this restaurant has a fine selection of Sichuanese food (including many “chilli” dishes you can get with frog, sea cucumber, and numerous pork parts), what you want is what you’ll see when you first walk in. The front counter contains a display of Spiced Cold Dishes that make for a fine (and quick) start to any meal. Try the pig ear, tripe, and chicken gizzards. Szechuan Chef: This is one of Bellevue’s oldest Sichuanese restaurants, and still one of the best. Order the Special Hot Chow Mein and ask for hand-shaved noodles plus your choice of meat. Holding a block of dough, the chef uses a knife to expertly flick noodle strips into boiling water. They’re then stir-fried, resulting in slightly chewy noodles with just a bit of smokiness from the wok. Tofu 101: On Wednesdays and Saturdays, there might as well be a revolving door here, as that’s when you can get Cifantuan for breakfast. You won’t see these rice rolls; you just ask the cashier, who’ll ask how many you want, and whether you want warm soy milk to go with them. (You do.) The rolls are pretty big, made with purple rice and stuffed with pickled vegetables, pork floss, and a Chinese donut that adds crunchy texture. Take-out only. Top Gun Seafood Restaurant: The Dim Sum in Bellevue is far from Richmond, B.C. quality, but this place is best of the bunch. Carts come pretty quickly, and if you persist, you can find tripe and chicken feet below the baskets of dumplings that the servers are quickest to pitch to non-Chinese clientele. The Football (Hum Sui Gok) is a dumpling of sweet and chewy dough that’s deep-fried and filled with ground pork and mushrooms. Twilight 7: The language barrier can be difficult, making menu-deciphering somewhat challenging, but persevere and order the customizable House Special Combination Pot. You can choose your favorite meats, vegetables and more. Quail eggs, pork belly and “King mushrooms” are great, and the bowl will come with Sichuan peppercorn and chili for a ma la experience. You can also experience karaoke and a bit of cosplay at this quirky restaurant.